Are you too young to get a silver string??? All of us have to fight with graying of hair at some or the other point of our life. While a few of us get the first silver string at the age of 50 and a few others in early 20s. A few flaunt their salt and pepper look but a few others freak out. 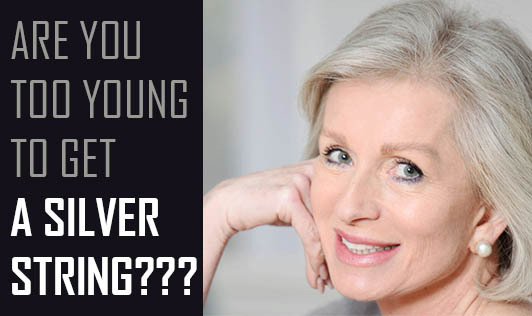 Find out the truth behind premature graying. • Premature graying occurs when the color producing cells stop producing pigments. • In a few cases, naturally occurring hydrogen peroxide can bleach the hair turning it gray! • Studies are yet to confirm the correlation between stress and premature graying. • Graying is largely determined by genetics. • A few autoimmune disorders cause colored hair to fall out, turning hair white! • A vitamin B-12 deficiency or hypothyroidism or even malfunctioning of the pituitary gland can also lead to premature graying. However, premature graying can be reversible if the above deficiencies are corrected. People adopt different methods to hide graying like highlights, semi permanent or permanent colors. Always remember the consequences of using hair colors and the health risks associated with overuse of chemicals. It is time to break the myth of gray hair and ageing and be vibrant, active and feel young at heart. Embrace graying.